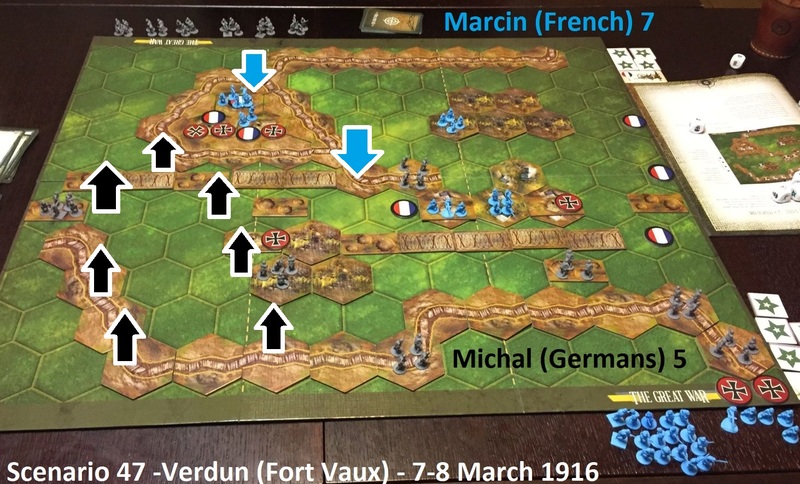 So, the French Army expansion to the The Great War really grabbed mine and Marcin’s interest – no surprise then that we continue with the Verdun scenarios. Today another four session reports, enriched with many pictures where you can see the scenarios set-ups, situation development and final results. 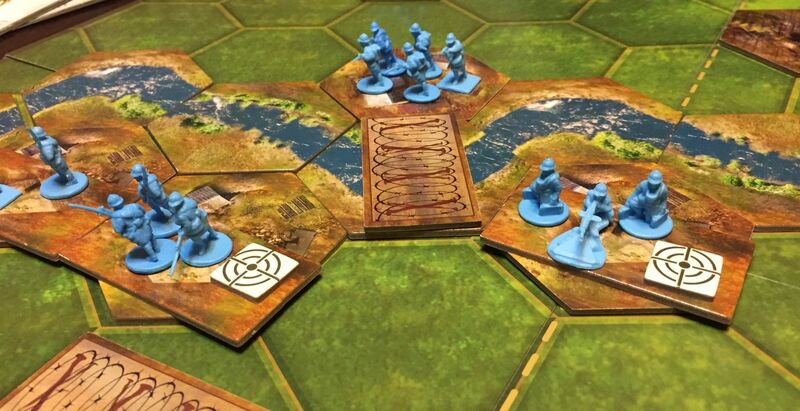 As well as appreciate the beauty of the game – both in its graphical dimension as well as interesting game-play! 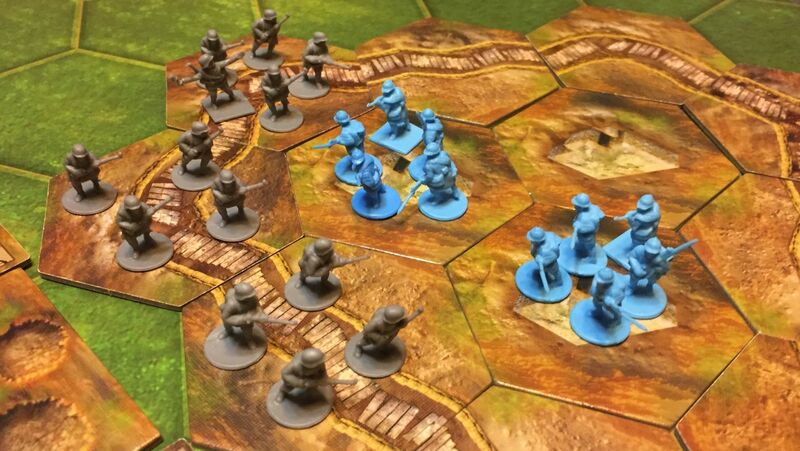 However, that was all what my forces were able to accomplish that day and had to suffer staggering defeat 2-7! Once the forces on the hill were weakened, the Infantry Assault card led Germans forces forward. They were unstoppable. 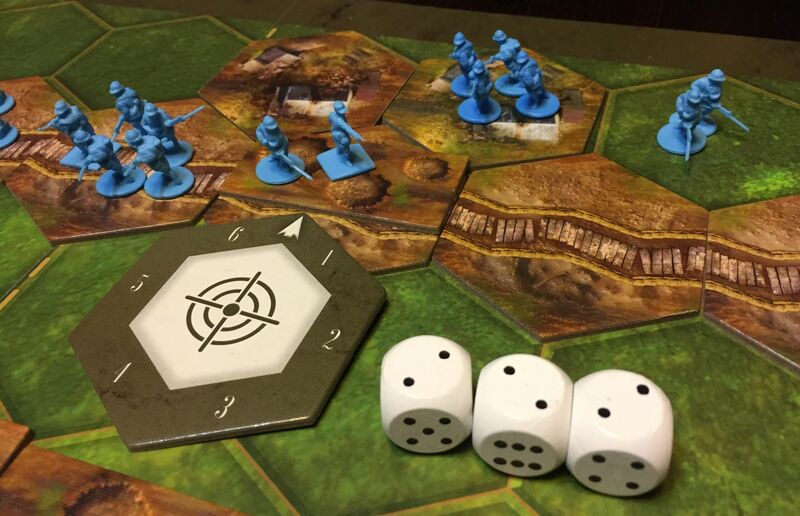 Another scenario with Fort – I like those, as you have clear target and a lot of fun who gets there in sufficient numbers on time to hold it. 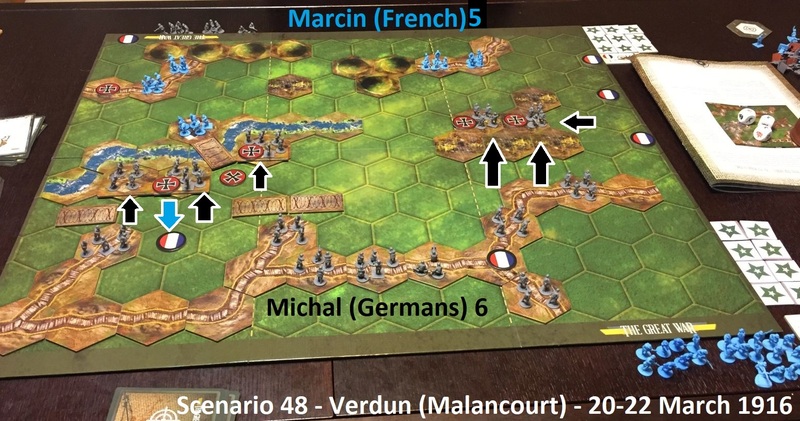 French MG attacks German Bomber… just to be surprised by Ambush! 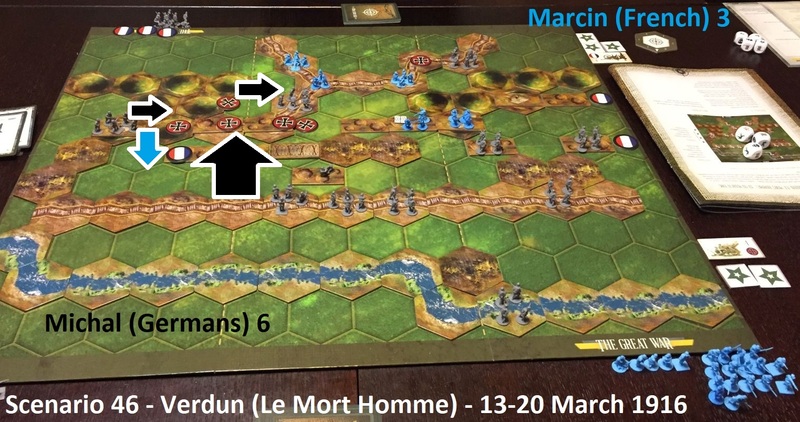 In the end, thanks to two recon cards as well as counter-attack in the center, Marcin and his French troops prevailed! I advanced with Engineer on the left, cut the wire, attacked but was repulsed and killed. 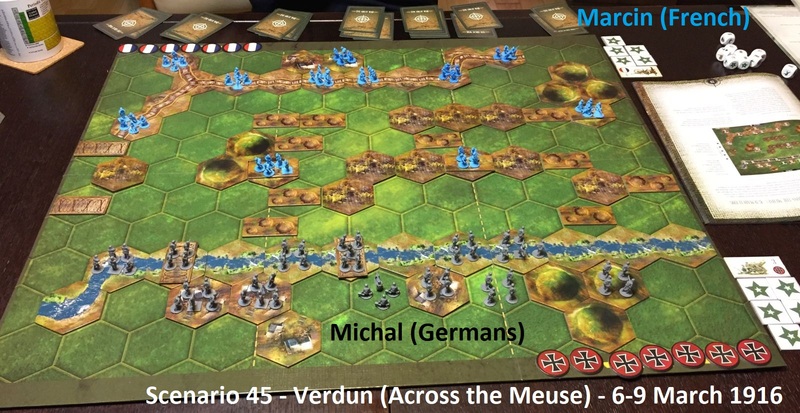 Another French victory? No way! 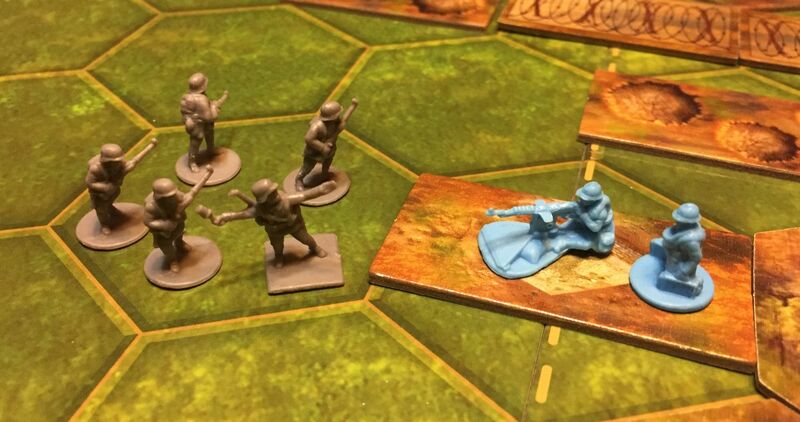 Spotted here, spotted there – if you want to take fortified position, use mortar! 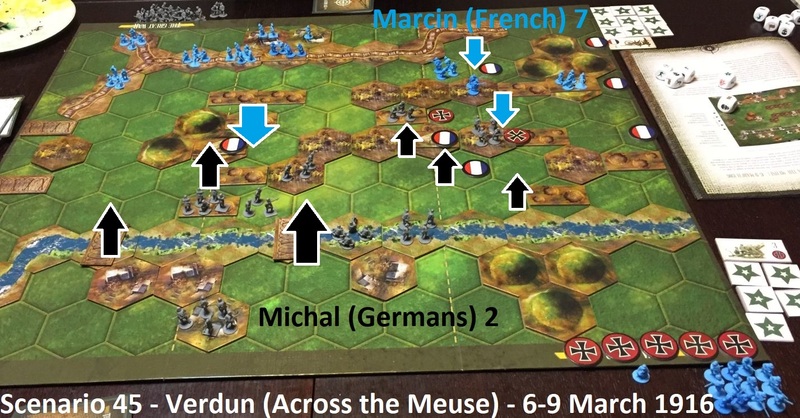 To finish the game, I attacked the forest on my right and cleared it from French presence, narrowly winning the game! 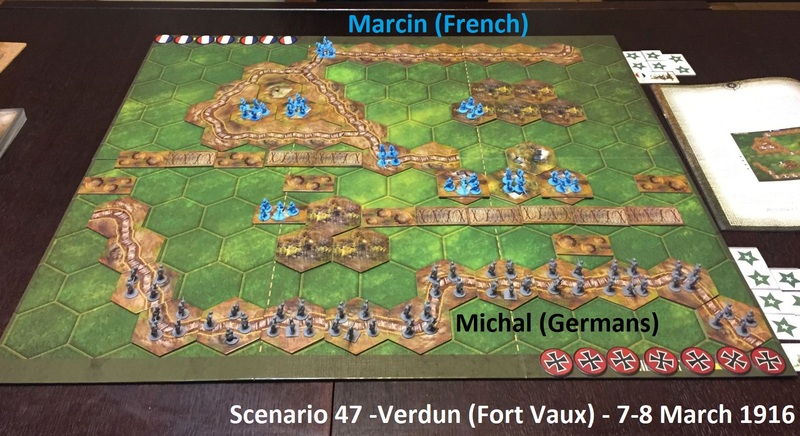 Wow, that was a lot of fun with those 4 scenarios – they are pretty varied, with different objectives and initial situation. They also require using specific tactics and combos to succeed. I have feeling that 45 and especially 46 are slightly unbalanced. However, this is not a problem as you can always switch sides. More to come! Cannot wait to get to the Tank scenarios!